Reality in Writing : Caribbean Political Economy: Is the War on Drugs in the Caribbean Going Up in Smoke? Is the War on Drugs in the Caribbean Going Up in Smoke? Despite the war on drugs being lost long ago, the debate on a progressive drug policy in the Caribbean is showing positive signs of revival due to increased campaigning on behalf of community organizations, farmers, and academics. Earlier this month, Caribbean Community (CARICOM) leaders met in St. Lucia to discuss regional issues in the usual fashion but were joined outside by a small but vocal demonstration campaigning for the decriminalization of marijuana. The Cannabis Movement is certainly doing its best to make sure that happens. Despite being only a little more than a year old, the organization has already hosted information booths at public events and educational exhibits in the Castries Town Hall, where they discussed the benefits of the Cannabis "herb" as a medicinal as well as an industrial crop. The organization’s public relations officer Gordon Rae added that “On the advice of the Royal Saint Lucia Police Force, the Movement has added a prevention component so that the public is made aware that our intention is not the promotion of the use of marijuana but the decriminalization of the plant in all its beneficial forms”. According to the U.S. State Department’s 2012 International Narcotics Control Strategy Report, St. Lucia reported that more than 80 percent of all arrests made on the island were drug related. Thirty miles south of Martinique (a French Department and part of the EU), St. Lucia has become an increasingly lucrative transhipment point for narcotics. A quick glance at the police's news archives will reveal that a vast amount of illegal activity on the island is related to the cultivation and trafficking of marijuana. With the decimation of the island’s banana industry due to the collapse of preferential trade agreements with Europe, land which was once used to cultivate bananas is now being used to grow marijuana, as it has now become one of the only realistic ways for rural people to make a living. The situation is no different in St. Vincent, where the collapse of the banana industry has led to marijuana becoming the largest source of agricultural income on the island. 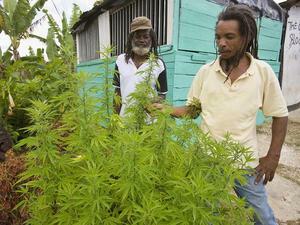 According to the 2012 Narcotics report, St. Vincent has now surpassed Jamaica as the largest marijuana producer in the Caribbean, where “according to officials, marijuana producers have recently started labelling their product for export.” Despite the threat of a criminal conviction, cultivators have established the St. Vincent Marijuana Growers Association in order to lobby their interests and regulate the industry. Representatives of both the Cannabis Movement and the St. Vincent Marijuana Growers Association argue the income from taxes on legal marijuana could provide a much needed boost to the cash strapped islands. These happenings in St. Lucia and St. Vincent are not the only ones occurring, but they highlight the need for a new round of serious talks on the decriminalization of marijuana in the region—yet no Caribbean leader seems willing to be the first to openly advocate decriminalization. The current position on decriminalization also has tremendously negative consequences on the life chances of the Caribbean’s young people. According to statements made earlier this month by Jamaican Senator Tom Tavares-Finson, "On a weekly basis, … at the Resident Magistrate's (RM) Court at the Half-Way Tree Courthouse, approximately 300 young Jamaican males receive criminal records for minute quantities of ganja. It means that we are creating a pool of young persons who cannot be employed, who cannot join the military, who cannot join the police force and, indeed, cannot, in some instances, seek further education. They can't travel because of this conviction." The issue of decriminalization is not just a Caribbean one, but a hemispheric one. In 2011, Former President of Mexico, Ernesto Zedillo; former President of Brazil, Fernando Cardoso; former President of Colombia, Cesar Gaviria, and other Latin American leaders spoke out regarding the Latin American Commission on Drugs and Democracy in a report titled Drugs and Democracy: Toward a Paradigm Shift and called for the immediate decriminalisation of marijuana. The commission was especially critical of the United States, which its members say must lead by changing its anti-drug policies from being guided by anti-crime approaches to ones rooted in health care and human rights. At the most recent Summit of the Americas, President Obama said that “I think it is entirely legitimate to have a conversation about whether the laws in place are ones that are doing more harm than good in certain places” but shaped the outcome of that conversation in advance by flatly concluding that “legalization is not the answer.” It is highly unlikely that a small and vulnerable Caribbean island will be the first to step forward and decriminalize cannabis considering all of the political and economic consequences for doing so, but they may be next in line to follow the trend once Brazil, Mexico, or Columbia makes the first move. Is the Hope for Haiti's Homeless?